An accomplished client advocate with experience navigating commercial disputes from start to finish in state and federal courts and before arbitration tribunals. 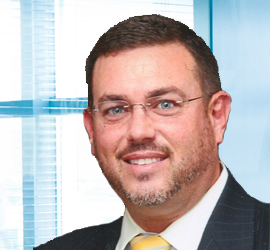 Jeffrey Paul Lutz is a member of Culhane Meadows’ litigation and real estate practice groups. Mr. Lutz’s practice focuses on representing individuals and businesses in contract-based disputes. Due to his past work background and family connections, Mr. Lutz has significant experience working with and for companies involved in commercial and residential development. His many clients are involved in all aspects of development and construction: real estate developers and owners, agents and brokers, design professionals, and general contractors and specialty subcontractors. Mr. Lutz represents these companies in contract negotiation, drafting, and myriad construction-related disputes including the following: bid protests, mechanics’ and materialmen’s liens, broker’s liens, performance and payment bonds, design defect, workforce supplementation, delay and scheduling, project settlement cramdowns, real property tax assessments, design infringement, project change orders, and extra-contractual performance. Mr. Lutz also represents small and large corporations involved in commercial and business disputes, and has taken a lead role in litigation involving the following claims: breach of contract, unfair business and/or trade practices, defamation, fraudulent transfers or conveyances, covenants not to compete or solicit, breach of fiduciary duty, partnership dissolution, landlord/tenant disputes, trademark and copyright infringement, and tortious interference with business and/or contractual relations. For his many accomplishments, Mr. Lutz has repeatedly been named a Georgia Super Lawyer® “Rising Star” representing the top 2.5% of all Georgia attorneys under the age of 40. He has also achieved a preeminent “AV” rating in ethics and legal competency from his peers and Martindale-Hubbell®, as well as a “Superb” rating from Avvo.com, an independent rating company. Georgia Construction Law: What do you do when…?, Co-author, National Business Institute, 2003. Georgia Construction Defect and Mold Litigation, Co-author, National Business Institute, 2003. Employment Rights Under USERRA, Speaker, Columbus Bar Association, 2004. Cybercrime in the U.S.- Protecting Your Clients from Theft by Computer, Co-author, Georgia State Bar Spring Conference, 2006; International Lawyers Network, Summer 2007. Construction Law in Georgia, Author and Speaker, American Bar Assoc., Community Outreach, 2006. Construction Law Glossary, Contributing Author, ABA Forum on the Construction Industry, 2007. Construction Management Design/Build, Author and Speaker, Lorman Education Services, 2007. Construction Law for the General Practitioner, Author and Speaker, Georgia ICLE, 2007. Construction Law for Architects, Engineers and Contractors, Author and Speaker, Half Moon Seminars, 2009. Construction Law for the General Practitioner, Author and Speaker, Georgia ICLE, 2009. Construction Law for the General Practitioner, Author and Speaker, Georgia ICLE, 2011. Construction Law for the General Practitioner, Author and Speaker, Georgia ICLE, 2013. Filing and Protecting Materialmen’s Liens in Georgia, Author and Speaker, Georgia ICLE, 2014, 2015, 2016. Carolina Cas. Ins. Co. v. Ragan Mech. Contrs., Inc., 262 Ga. App. 6, 584 S.E.2d 646 (2003). Vinings Jubilee Partners, Ltd. v. Vinings Dining, Inc., 266 Ga. App. 34, 596 S.E.2d 209 (2004). SuperValu Inc. v. KR Douglasville, LLC, 272 Ga. App. 710, 613 S.E.2d 154 (2005), reconsideration denied Apr. 12, 2005, cert. applied for and denied, KR Douglasville, LLC v. SuperValu, Inc., 2005 Ga. LEXIS 602 (Sept. 19, 2005). Groth v. Ace Cash Express, Inc., 276 Ga. App. 350, 623 S.E.2d 208 (2005). U.S. Micro v. Atlantix Global Systems, LLC, 2006 WL 1390447 (2006). Williams v. Renaissance Development et. al., Ga. Ct. of Appeals Case No. A11A0817 (January 18, 2011). Seaboard Construction Company v. Kent Realty Brunswick, LLC, 331 Ga.App. 742, 771 S.E.2d 429 (2015). Mr. Lutz is a 12-year veteran of both the U.S. Army and Georgia Army National Guard. While on active duty, he served as a team leader and Non-Commissioned Officer with the 1st battalion, 75th Ranger Regiment where he was deployed throughout the United States, Central and South Americas, and Europe. Among his many awards, Mr. Lutz received the Army Commendation Medal, Army Achievement Medal (Fourth), Expert Infantryman’s Badge, Master Parachutist Badge, and the coveted Ranger Tab. Mr. Lutz and his wife have two sons. He is an avid college football fan and, in his spare time, enjoys coaching his sons’ youth sports teams, tennis, golf, hunting, hiking and all things outdoors.